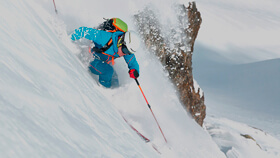 Iconic products stand for cutting edge technology in the Dynafit product development. In this category our core values speed, lightness, endurance and technology merge into the perfect products for the mountain endurance athlete. Our Iconic products are innovative, built with the latest technologies and combine minimalism and efficiency. These products set a new standard in the industry and enable the mountain endurance athlete to push his or her boundaries further or even define them new. For Winter 17/18 we have three Iconic Products. Every second week we will introduce you to another product. Focus right now is the DNA helmet. For Winter 17/18 we have three Iconic Products. Every second week we will introduce you to another product. Focus for the next two weeks – TLT Speed Binding. Get a look at our helmet expert Hannes demonstrating the new DNA Helmet in a product video on our Facebook page. Whether you are out on a climb in alpine terrain or racing down a speedy downhill on the slopes -- the DNA Helmet promises secure protection for your head with its double certification in both Alpine Skiing and Mountaineering. Add to that a weight of only 300 grams, making it the lightest helmet with double certification anywhere in the world. Innovative materials and a multitude of vent holes ensure maximum ventilation so you avoid overheating. With its Boa 360 closure system, the helmet also adapts to every head shape superbly. You’d like to find out more about our DNA Helmet? Take a look at this video to see how the helmet looks and to find out in detail how it works. Or follow our Facebook Intro Session. Stylish, comfortable, safe and ventilated… In a 300g package. What else could you desire? For Winter 17/18 we have three Iconic Products. Every second week we will introduce you to another product. Focus right now is the Speed 90 Ski. Watch the intro of the new SPEED 90 Ski on our Facebook Page by our ski expert Robert. The Speed 90 ski is the perfect all-round ski -- one that pairs lightness with performance. Thanks to its “Full Micro” sidewall construction, this ski skillfully edges on hardpack and steep terrain. Even on pow days, you are well equipped with the Speed 90. With its rocker tip and a 90 mm waist, the ski floats through fast, sweeping turns. The Speed 90 achieves top performance weight and balanced handling characteristics from its specially tuned Paulownia wood core combined with micro sidewalls and an ingenious 3D construction. Just 1,280 grams at a 176 cm length and 90 mm waist, the Speed 90 ski counts among the lightest skis in its category on the market today. You want even more information about our SPEED 90 Ski? Watch the video to see how it looks like and how the features work in detail. Or follow our Facebook Live Introduction Session. One does it all -- The ski for any and every day for passionate ski tourers. Watch the live intro of the new TLT Speed Binding on our Facebook Page by our binding expert Philipp. With a minimum weight of just 285 grams and the safety of an adjustable lateral release (DIN 6-12), the TLT Speed Binding combines the benefits of the worlds of racing and skitouring. If needed, a ski stopper can be mounted optionally. With these benefits, the binding enables you to go further and higher at the same exertion or to tackle faster uphills, without a compromise in the safety during the descent, even in demanding terrain. You want even more information about our binding? Watch the video to see how it looks like, how the features work in detail and how you can mount the brake. Or follow our Facebook Live Introduction Session. Lightness and safety – the TLT Speed Binding is the new all-purpose weapon for the ambitions ski mountaineer.